Adrien, an artist, and Martin, an antique dealer, are spending the summer in a house just outside St Tropez. Also staying there is Haydee, a young woman who seems to sleep with a different boy every night. She is a "collectionneuse", collecting men as other people collect artworks. In their different ways, both older men try to resist becoming part of her collection. 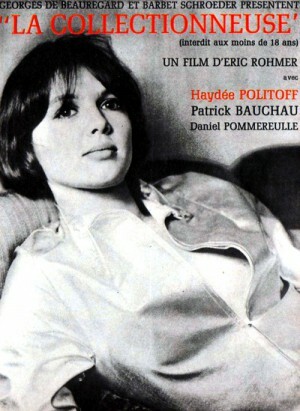 La Collectionneuse is part of Rohmer's "Six Contes Moraux" (Six Moral Tales), numbered IV. (I and II are the short The Girl at the Monceau Bakery and the mid-length Suzanne's Career. IV was made before III, which is My Night at Maud's.) In each of the Moral Tales, a man is faced with a moral dilemma, but the film is, according to Rohmer, "less concerned with what people do than with what is going on in their minds while they are doing it". In short, with character rather than action.